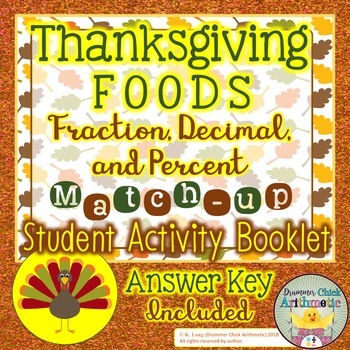 Your students will have FUN working with the names of Thanksgiving foods while they practice the necessary skill of fraction/decimal/percent conversions. 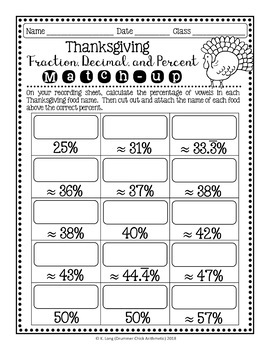 After they convert the number of vowels per food name (out of total letters) into a percent on the work pages, students will cut out the names from a separate page and glue each one onto the box with the matching percent. 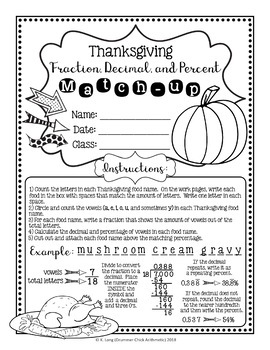 Students will love the self-checking nature of the activity! An extension page is included for your early finishers. 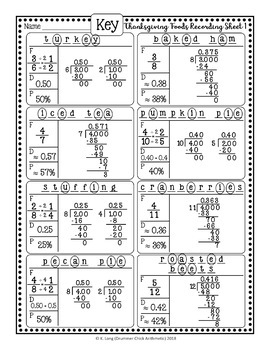 Is this resource easy to implement? YES! The pages are meant to be stapled like a booklet with the cutting page separate (the cutting page has two sets of food names and just needs to be cut in half). Simply copy, staple, and go! What about the answer key? Always included!!! With all work shown!!! Of course! Simply click the star near my store name ("Follow Me") to be notified by email when new elementary and middle-school products are released. New resources are 50% off for the first 48 hours! I've heard that I can earn credits on TpT by leaving feedback. Is that true? Yep! When you return to leave feedback, you will earn valuable credits which can be used towards future TpT purchases!